Admit it. As much as we girls love sky high heels they do come with a not so great after effect... achy feet especially when we are in them for hours standing up or walking about. Thankfully for our feet no longer need to hurt 'coz you can change into these chic comfy flats when you're feet are crying out "I can't take it anymore!" Hahaha. 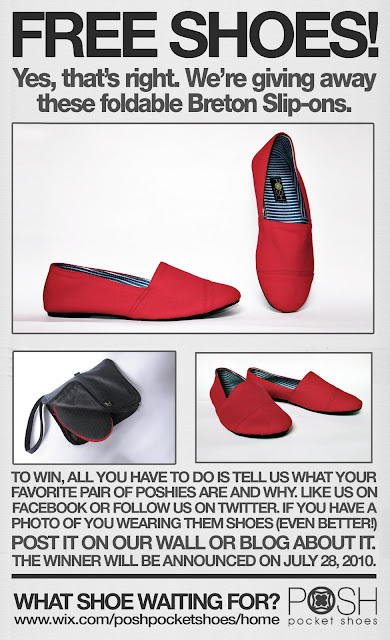 Oh and POSH pocket shoes is giving away a pair of their Breton Slip-ons! (These are my ultimate fave from their collection.) All you have to do is tell them what your fave pair of Poshies and why. If you already have a pair of Poshies, go take a picture of you wearing them! That's even better! Like them in Facebook, follow them on Twitter or heck do both! Post it on their wall or blog about it. The winner will be announced on July 28, 2010. That's next week already! So what are you waiting for? Go ahead blog about it! Who knows! You might be the lucky one to own these lovely shoes! And do catch them at the Super Sale Bazaar next weekend (July 30 to August 1, 2010) at the Rockwell Tent. i really love the bow flats too! great collection i bet~! high heels hurt. that's the truth! i usually carry some ballet flats or my trusty havaianas when i'm in heels but they can take up a lot of bag space. 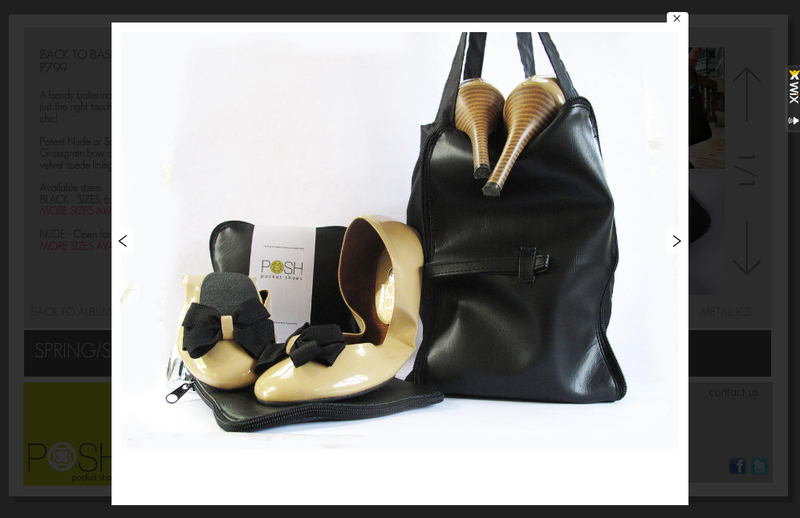 the foldable flats are the perfect solution!!! loooooooove!!! are they really that comfy? one issue i have with some of my flats is that the soles are thin that after awhile, i feel the pavement on my soles.